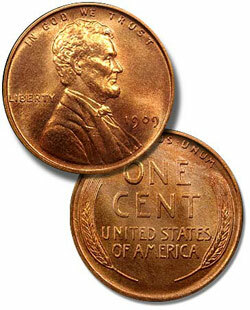 The Lincoln Cent Society has ceased to function due to lack of membership support. Welcome to the official internet home of the Society of Lincoln Cent Collectors! We have ceased operation for the time being until a new model can be reached that will involve more member participation. For this to succeed club bylaws and member support to include article writers and an active volunteer staff of board members will have to come forward; a club cannot be successfully ran by one person. If you would like to be notified if we regain active volunteer members, please read on. What is the Society of Lincoln Cent Collectors? This nationwide club devoted to the Lincoln cent collector is currently not functioning because of lack of member participation. If you would like to be an active volunteer to help revive this club, please send us an email. If you would like to become a member and receive the club's benefits and information once we have an active volunteer staff, please send us an email. If the club comes back into activity, we will let you know. What does the SLCC need to survive? Active participation in a club is vital to its success. For many years this 'club' was ran by one person who never asked for assistance, but when I took the club over in 2006 I spent three years begging for active assistance. Nobody stepped forward to assist me in turning this into a real club with a board of governors, an auctioneer, a secretary, and a newsletter publisher. If you are reading this, that must mean you have some interest in Lincoln cents and would like to see a running club with active participants. Send an email and let me know you're willing to help. When I get enough active volunteers willing to take on the responsibility of running a club, I will revive the club and the website. Until then, this website will sit vacant. I do not wish to see it sit vacant, but I cannot run a club alone. I hope enough people step forward.